Marine rescuers were able to free a humpback whale from a potentially life-threatening entanglement Thursday at Sarkar Cove near Prince of Wales Island in Southeast Alaska. 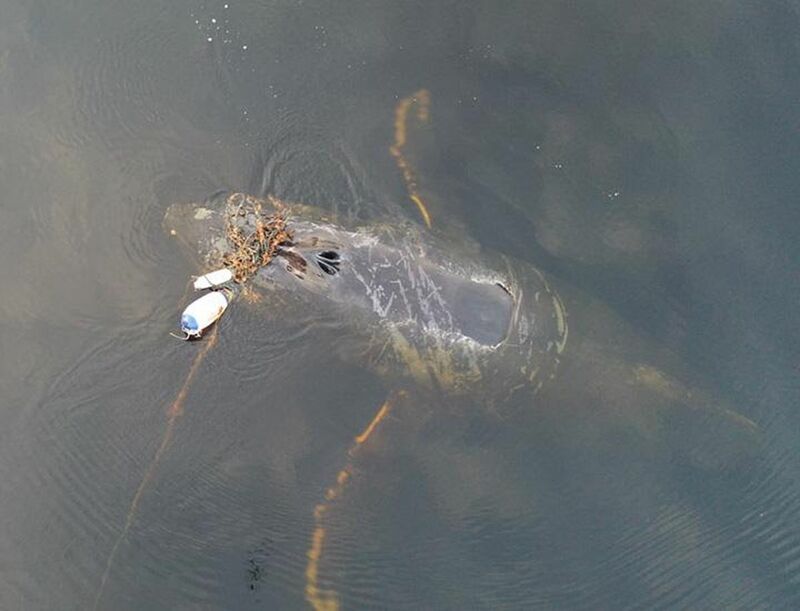 When rescuers with the National Oceanic and Atmospheric Administration arrived to help the whale, it had been entangled in a mess of heavy gauge lines used for mooring docks for at least two days. Two buoys also caught up in the entanglement, along with a dense knot “about the size of an ice chest,” made matters even more complicated, NOAA said. Rescuers said it appeared as though the whale’s entire body had initially been entangled, leaving behind chafing marks. Several lines were covering the edge of the whale’s blowhole, restricting the animal’s breathing. When a whale becomes entangled, it not only faces an immediate threat of drowning, but it also becomes unable to feed, reproduce or socialize — all of which are vital to the animal’s survival, said Fred Sharpe, a research biologist with the Alaska Whale Foundation. Even after a whale is freed, its injuries can cause long term health problems, Sharpe said. The whale’s distress made it difficult for rescuers to approach it at first. As it thrashed from side to aside in a vain attempt to free itself, its tail caught on the snarl and also became entangled. After about six hours, Sharpe and his team were able to slip a hooked knife with line attached onto the entangling lines. Then, after several cuts and a team tugging effort, the whale was free. Rescuers said the whale swam away, headed out to the mouth of the bay, about 30 minutes before nightfall. Sharpe said because the whale had been entangled for a relatively short period of time, it didn’t appear to be injured enough to cause long-term damage. NOAA will continue to track the animal’s health and recovery, he said. “Our lives are enriched by these magnificent animals,” Sharpe said. 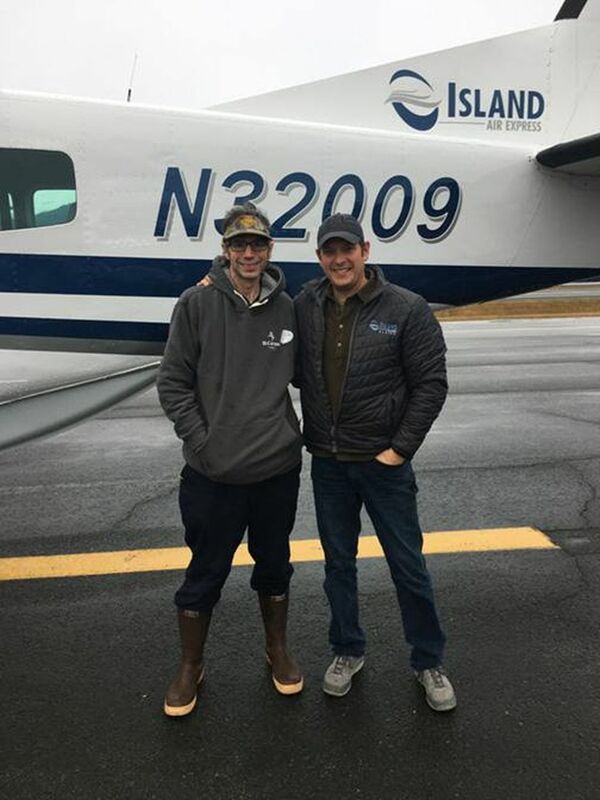 Both Sharpe and Scott Van Valin, the owner of a local air carrier and lodge who reported the entangled whale and assisted in the rescue, postponed their Thanksgiving plans to free the whale. “We would like to commend Scott’s and Fred’s efforts during this event, which resulted in a safe, deliberate assessment and rescue,” said Sadie Wright, acting large whale entanglement response coordinator for NOAA Fisheries Alaska Regional Office. NOAA cautions mariners to keep a sharp lookout for entangled marine mammals, but not to approach closely or attempt to free them. The organization says well-intentioned good Samaritans have lost their lives trying to aid trapped animals. Instead, the organization advises anyone who sees a distressed marine mammal to keep at least 100 yards away and report it to the NOAA Fisheries 24-hour Alaska Marine Mammal Stranding Hotline at 877-925-7773.